Traps suitable for live-trapping skunks can be rented, purchased, or constructed. Local rental agencies have a number of traps available at a reasonable fee or they may be purchased from a hardware store. On the other hand, a suitable trap is easily constructed from scrap material using the plan illustrated. Nuisance animal control operators can trap problem animals for a prescribed fee. There are a number of licensed individuals who are prepared to assist anyone with a skunk problem. Always check provincial and municipal regulations before disturbing any wildlife. Skunks can be trapped at entrances of known denning sites, or trapped about their feeding areas. A wooden box trap with a wire mesh end is ideal. Leg hold traps or any kill device such as a conibear trap should be avoided. Skunks caught in box traps can be safely moved if caution is taken to avoid shaking the trap. Wire mesh traps must be carefully covered with a cloth material before moving. To release an animal, the door is opened permitting the animal to leave on its own, unmolested. It is advisable to stand upwind when releasing an animal. Mix the above together in a plastic bucket and wash the infected object, be it human, canine, feline, garage, shed, car basement, etc. Make sure you keep the solution away from eyes, nose and mouth. 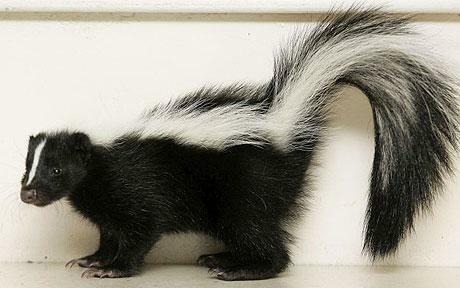 The skunk odour should disappear immediately!